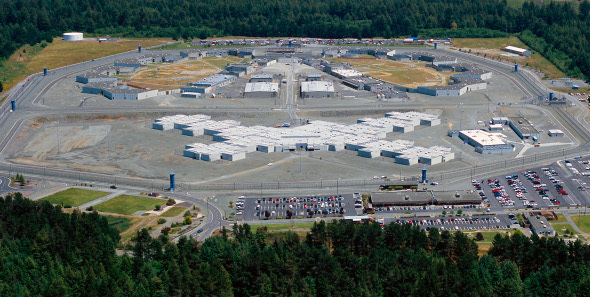 Pelican Bay State Prison, with its infamous x-shaped Security Housing Unit section. On the first day of this month, inmates at Pelican Bay State Prison, joined by inmates in other prisons around the state, began a hunger strike to protest “inhumane and torturous conditions” in the Security Housing Unit, which holds inmates in solitary confinement for decades at a time. They’re still at it; the state has admitted that as many as 6,600 inmates around the state have participated in the strike. On Saturday, corrections officials offered the prisoners a proposed deal, which they unanimously rejected. It stands to reason that the same criminal networks used to carry out crimes could be repurposed for organizing an act of nonviolent resistance. Such networks are not unlike the improvised channels of communication used by so many civil resistance movements—from secret codes, to smuggled letters, to Twitter. But, as Strickman says, carrying out a nonviolent campaign like a hunger strike can transform those networks from the inside. It unifies them, strengthens them, and trains them in modes of empowerment other than killing. It has been noted by some that Pelican Bay’s Security Housing Unit is reserved for the “worst of the worst” criminals, and that the kind of treatment they receive is a necessary security measure. However, a glance at the strikers’ demands suggests that they’re merely opposing punishment that is none other than cruel and unusual; they oppose racist tactics of collective punishment, the withholding of food as a means of punishment, the denial of constructive activities, and, perhaps most importantly, the very practice of decades-long solitary confinement—which, as Atul Gawande’s 2009 New Yorker article showed, is torture in and of itself. On Friday’s edition of Democracy Now! former inmate and strike mediator Dorsey Nunn explained, “The only model that these guys got left is the model of Bobby Sands and the Irish strike. That’s their model.” Which is to say, there are some who have committed to carrying on the hunger strike to their deaths. As the strike approaches its third week, death is becoming a real possibility. For the latest, listen in on a Critical Resistance national conference call this afternoon. There are also solidarity demonstrations taking place around the US and Canada. Your title is misleading! Human lives are at risk! @Rosemarie, I don’t understand why you think the title is misleading. You are correct in saying that human lives are at risk. That seems to be the purpose of the hunger strike – to raise alarm at the harm caused to inmates by the practices of Pelican Bay SP. The difficulty experienced in this hunger strike is the disconnect, real and perceived, between the aggrieved population (inmates) and their tactics (nonviolence). Michael Nagler speaks of Gandhi’s “rules for fasting”. They are, from memory, the right person, right timing and right reason. According to Nagler a fast was never a power politics move, rather an attempt to build on an existing connection between one person (satyagrahi) and another (focus of the nonviolent action). As such Gandhi did not “fast against” but “offered fasts to” an individual or group. Gandhi did not fast against Lord Irwin, but offered fasts to the people of India who were engaged in mob violence. Gandhi was the “right person” because of the respect he held in the eyes of the population and had already demonstrated his nonviolent capacity. It was the “right time” as people were able to “listen” to his fast, they weren’t entirely consumed by their anger, violence and desire to cause harm. And it was the “right reason” in that it was to bring people back to their stated goals and tactics of the Independence movement, namely, nonviolence. So a key problem with the inmates’ hunger strike is that they are probably not perceived to be the “right people”. Yes, they are victims, but they may not have a relationship of trust and respect with the SP officials. Also, this hunger strike may be seen as a “fast against” not a fast “offered to” the prison guards and officials. But this also raises other questions. Who could prisoners offer a fast to? Who would ever respect them enough? How could they have built relationships with the prison officials so that a fast was a call to the conscience of the officials and not seen as a pressure tactic? Perhaps this has already occurred and what we see in this public announcement is an attempt to undermine the existing nonviolence of the inmates. Hard to imagine, but it is possible. The other question is, “what nonviolent alternatives are available to prisoners kept in solitary confinement?”. They cannot blockade anything or engage in economic boycotts. There is little scope for the inmates to show their nonviolent convictions other than to voluntarily suffer until their demands are met. And one is left wondering if inmates have already availed themselves of the official channels of grievance and been ignored. Yes, human lives are at risk. Seeing through the PR is a big step towards building a just world, even for those deemed too dangerous to live in it. And as Nathan writes, even if the hunger strike is organised through gang channels, so what? There is a chance for the gangs to be changed by this experience for the better. It was only earlier this year that Jamaa Islammir (sp?) started using nonviolent sit-ins to block NATO supply lines in Pakistan. In nonviolence anything is possible! I suppose there’s no easy response to proof-texting, Rosemarie. The best I can offer is to say that resurrection is in the body—both the physical body and the social body. One can only be redeemed through the imperfect shells we find ourselves in, including groups like gangs. And that’s what I hope my post was pointing to. Chris, thanks for the really excellent analysis. While I think you might be correct that the “person” might be less than ideal in this case, for many people, the “cause” should be strong enough to override that. Yet Rosemarie is reminding us of something very significant here: most people in the United States consider themselves Christians, and Christianity calls on people to have special concern for those in prison. If people were in fact to do so, perhaps, in Gandhi’s terms, these would be the “right” kind of “person” after all. I believe the hunger strike to be valid human rights concerns. Many of the states 3,259 prisoners in the SHU have been there for over 30 years. Yet they have the courage to risk their lives for rights they may never see. Please show your support for HUMAN rights. While Nagler’s “rules of fasting” shed important light on the way this tactic is largely misused today, the prisoners are tapping into its power as a tactic in a different way. They seem to be saying that conditions are so bad, death is no longer an undesirable option. Dozens have been sent to prison infirmaries because of irregular heartbeats and fainting, according to a statement issued Monday by California Prison Hunger Strike Solidarity, which says it represents attorneys and family members of inmates. “Most have lost 20-35 pounds,” the statement says. We won because we loved life more. We decided to love life and you can’t beat life. If suicide really is the goal here, I would hesitate to call this a hunger strike. But, considering how well-organized the campaign is, how coordinated the strikers are and how coherent their demands are, I’d argue that these strikers do want to live and are fighting in order that they can. I wasn’t looking at this at all in terms of Gandhian thought. I also wasn’t saying that suicide is the goal. I was just observing that they have lost their fear of death because conditions are so bad. That is their leverage position. They would clearly prefer to live under better conditions. If they didn’t see hope for that and just wanted out, there are much quicker ways to die. In that sense, this hunger strike is more akin to what Bobby Sands and the IRA did. They won improved prison conditions. Unfortunately, it cost many lives to do it. The term “gangs” is often a law enforcement term to generate fear about black kids hanging out, to justify crackdowns, and, apparently, to discredit prisoner hunger strikes. It’s a public relations strategy. These “gangs” can be criminal or innocuous. To the extent they’re criminal, maybe, as Chris says, the strike will transform them for the better. And I appreciate Nathan’s point that we work with the tools we have, imperfect as they sometimes are. I have no problem seeing this hunger strike as a fast “against,” as opposed to “offered to,” California prison officials. No one is expecting prison officials to suddenly realize, because of this strike, that keeping human beings in small cells for 23 hours a day is barbaric. The strike is offered to the rest of us, to show us what kind of society we’ve become when we lock people away for decades in concrete cells with no one to talk to for years. So maybe, if prison officials are embarrassed enough, they’ll put fewer people in solitary confinement, end collective punishment, increase visitation hours, whatever. But they’re hoping they’ll win the public relations war, by somehow convincing us that thousands of prisoners stopped eating for a month because “gangs” told them so.